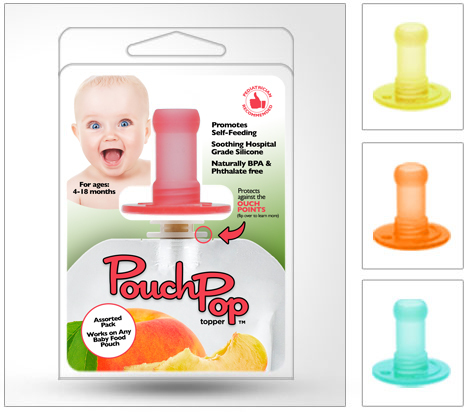 Top Notch Material: Pouch Pop: The Solution for Painful Baby Food Pouch Feeding! Pouch Pop: The Solution for Painful Baby Food Pouch Feeding! My little guy has only been on solids around a month, but he has totally found his groove and absolutely loves to eat!! I have found that the baby food pouches are much easier than the glass jars. They are so great to throw in the diaper bag when we are going on an outing and we do not have to worry because they are not breakable. They are wonderful, and perfect for older kids to drink right from the opening, but for the smaller babies, this can be tricky. The spouts of these are hard and short, so the baby cannot seem to get a good grip. I tried this with my little guy and he made a COMPLETE mess, there was baby food everywhere. Then I heard of Pouch Pop and they agreed to send me a sample for review and it solved that problem! 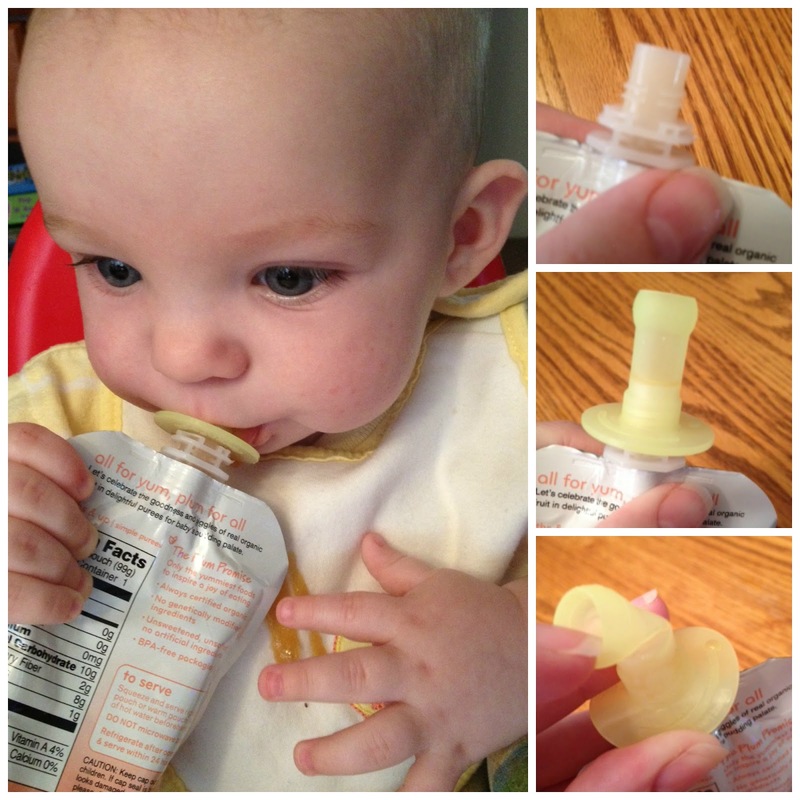 Using the Pouch Pop, my little man is able to grip the top better with his mouth, and even use it somewhat like a bottle. It is GREAT!! He can pretty much feed himself at 6 months old using this! Super cool, and I wish they had these or the baby food pouches when my oldest was a baby! As you can see in my photos, the tip is super soft and flexible and eliminates all of the “ouch points” on the pouches, and allows baby to enjoy their food in comfort and safety. Buy It: Pouch Pops are so cool and affordable too! You can purchase them for $9.99 on Amazon, but be sure to enter to win a set now! It's made with safe hospital grade silicone and is naturally BPA free. It has a universal fit. I wish they had pouches when my kids were little they look so convenient and easier to use. That it works with all pouches, encourages & helps baby to feed themselves & it's BPA free. I wish I'd had these for my daughter & will definitely be getting them for my son! I never thought about the plastic and all being "ouch points", but it does make sense. I do like how they will fit on any pouch since there are so many companies that make them along with the reusable ones. I don't have a kid yet. So, I hadn't thought about how many "ouch points" there are on pouches. This is a great tool for us to use when we have our kid. They are made of hospital grade silicone. Very nice! I learned they are made of safe hospital grade silicone and are naturally BPA free. i like that they cover up ouch points with soft silicone and come in cute colors. They are BPA free! Can't wait to try these! I learned that it protects the baby from 5 different ouch points. BPA scored big brownie points with me! Having never used pouch baby food I didn't know there were ouch points. Good to know ahead of time. I learned that these are pediatrician recommended! I also like that they are BPA free. I learned that it's made with hospital grade silicone. I learned that these are pediatrician recommended and bpa free. made with hospital grade silicone. I want to get one of these... my little guy loves these pouches. I learned that PouchPops are manufactured with premium, hospital-grade silicone. PouchPop allows for a natural transition from bottle feeding to food, teaches self-feeding and best of all it takes the ouch out of the pouch!